The taper! It’s like music to my ears. We put our long runs behind us and significantly decrease mileage in the three weeks leading up to the marathon. Now’s the time we just sit back, relax and enjoy the ride to Marathon Monday. The taper began with a 12-mile run. Piece-o-cake, right? Unfortunately that’s the mistake we trainees often make- this mindset that 12 miles is simple, that it’s nothing compared to the 21 we did the week before. As a result, we often lose sight of form, of pace and of our senses altogether. I can sincerely say that this did not happen to me. I was going a nice easy pace and paying attention to form more than ever… but it didn’t matter. In the last 2 miles of the run, an excruciating pain in my right foot began to take hold and never went away. I chalked it up to general fatigue at first. But when the pain did not let up into the night and the entire next day, I knew something was wrong. And I was right. 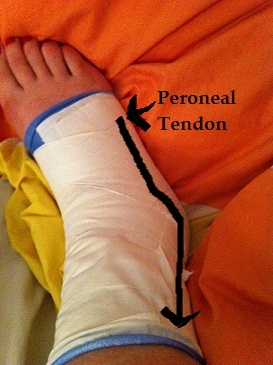 My physical therapist (Kennedy Brothers in Boston) diagnosed it as Peroneal Tendonitis, which affects the tendon that connects the bottom outside edge of my foot through the heel and to the calf. I have been going through some aggressive physical therapy over the last week and plan to continue until Marathon Monday. I’ve been taped, iced, electrically shocked, and stretched. I will do much more if necessary to get me to that starting line. The good news: I’ve been told that I am fully ABLE to run, meaning that I will not do any permanent damage to my tendon should I decide to proceed. There is no tear and the tendon is fully in tact. The worst case scenario is that I’ll feel pain. Lots of pain. I’ve decided that that is something I can manage. It isn’t as if the marathon isn’t pain-free as it is and I still have one full week to let the foot rest. The bad news: Sadly, I’ve decided to forgo my time goal this year. With an injury afoot (badoom chick! ), a time goal is just not realistic for me. If I do finish under 5 hours like I’d hoped, I will feel truly wonderful and will take it as an added bonus. However, my only hope now is to finish in “relative comfort,” as Coach Rick would say. I just need to focus on keeping my foot stable enough to get to the finish line. I’d be lying if I said I was ok. I’m trying to put on my happy face for everyone who has been so supportive of me over the last 5 months, but I am bummed about this untimely injury. Truly bummed. It goes without saying that I am also very thankful that it isn’t worse than it is. So my plan is simply to do my best. That is all I can do. So to everyone who has shown me so much love and support over the last week and throughout my 5 months of training, to friends, family and readers like you: Thank you for the encouragement. Thank you for the kind words. And thank you for being there. I love you all! I’m happy to announce that I have reached my fundraising goal and have raised a total so far of $10,616! If you would like to contribute, please visit www.razoo.com/sheree. ← 21 miles: Uselessly useful tips for surviving a long run. Incredible, Sheree, just incredible. Enjoy your moment. You’ve done so much good for so many others in need, and now it’s your time to shine! Soak it up and enjoy every moment. So proud!!! I’ll be tracking every mile!